Children up to 4 years are free of charge. Extra bed is possible for 600 CZK/ day. Pets are allowed for 200 CZK/ day. Cesky Krumlov hotel Alchymy Riverside is newly opened small hotel on the bank of the Vltava river – right in the very center. The building has two floors and is from the 14th century. It was many times reconstructed and last reconstruction to enable modern accommodation took place in 2009. Quiet and elegant rooms offer attractive views either to the street Dlouha or Cesky Krumlov Castle and Vltava river. All rooms have private bathrooms with toilet and bathtub, double beds in the bedroom, direct dial phone, internet connection, minibar and SAT TV. All rooms are for non smokers. 2 extra beds are possible in all rooms besides no. 1, 4, 5 and 8. Rooms no. 1-4 are on 1st floor. Rooms no. 5-8 are on 2nd floor. Suites are on 3rd floor. 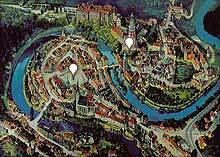 Parking is available only 200 meters from the Cesky Krumlov hotel Alchymy Riverside for 150 CZK per day. An old house of citizen Vaclav from middle ages was rebuilt to a municipal malt house in 1503. Since than only cellars and part of the outer walls have been preserved. In 1645 was malt house halted. Shoemakers and strapmakers lived here than. During the time, the house started deteriorate and only extensive reconstruction in 1838 saved the building of hotel Alchymy Riverside in Cesky Krumlov for further generations. Preserved historical layout (from 1830) is the most remarkable feature of the building.